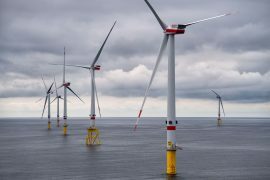 Ørsted is expecting a faster ramp-up of generation from the 450MW Borkum Riffgrund 2 offshore wind farm due to good progress on offshore construction which will be completed in the fourth quarter of 2018. Fred. 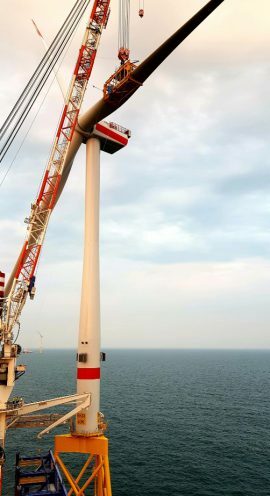 Olsen Windcarrier’s jack-up installation vessel Bold Tern installed the final MHI Vestas 8MW turbine on Ørsted’s Borkum Riffgrund 2 wind farm on Friday, 31 August, completing the project ahead of schedule. 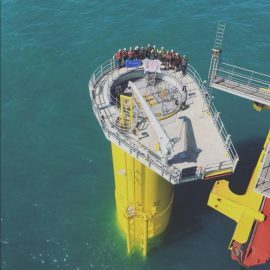 The Norwegian Geotechnical Institute (NGI) has designed and installed Structural Health Monitoring (SHM) systems on two of 20 suction bucket jackets at Ørsted’s Borkum Riffgrund 2 offshore wind farm. Fred. 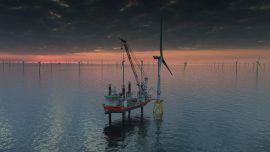 Olsen Windcarrier has shared a timelapse video of the jack-up vessel Bold Tern installing an MHI Vestas V164-8.0 MW wind turbine on a suction bucket jacket foundation at the Borkum Riffgrund 2 wind farm in the German North Sea. 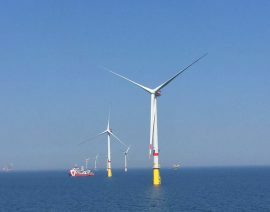 Van Oord has completed the cable installation work for Ørsted’s Borkum Riffgrund 2 offshore wind project in the German North Sea. Framo, part of Alfa Laval, has provided its pump technology for the installation of the suction bucket jacket foundations at the Borkum Riffgrund 2 offshore wind farm. 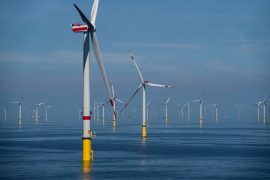 Ørsted’s 450MW Borkum Riffgrund 2 offshore wind farm fed electricity into the German national grid for the first time on Saturday, 4 August. 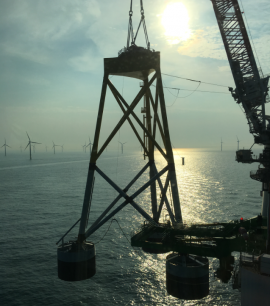 GeoSea’s jack-up vessel Innovation has installed the last of the twenty suction bucket jacket foundations on Orsted’s 450MW Borkum Riffgrund 2 offshore wind farm in the German North Sea. 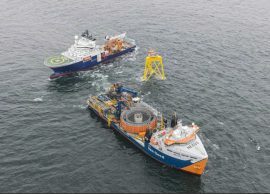 Van Oord’s cable lay vessel Nexus has loaded the final set of inter-array cables for the Borkum Riffgrund 2 offshore wind farm and is currently installing them at the site in the German North Sea. 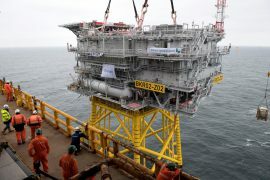 The offshore substation topside for Ørsted’s Borkum Riffgrund 2 offshore wind farm has been installed at the site in the German North Sea. 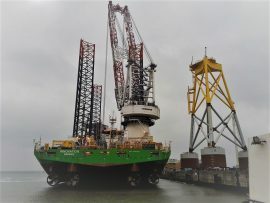 Poland’s ST3 Offshore has sent off the last shipment of suction bucket jacket foundations built for Ørsted’s Borkum Riffgrund 2 offshore wind farm in the German North Sea. Fred. Olsen Windcarrier’s jack-up vessel Bold Tern has installed the first MHI Vestas 8MW turbine on a suction bucket jacket foundation at the Borkum Riffgrund 2 offshore wind farm. Fred. 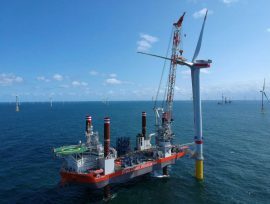 Olsen Windcarrier’s jack-up Bold Tern is completing its fifth run on Ørsted ‘s Borkum Riffgrund 2 offshore wind farm and is currently installing the 19th MHI Vestas 8MW turbine at the site in the German North Sea. 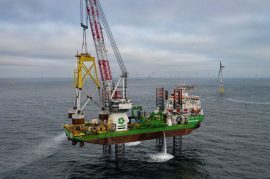 GeoSea’s jack-up vessel Innovation has installed the first out of a total of 20 suction bucket jacket foundations at Ørsted’s Borkum Riffgrund 2 offshore wind farm in the German North Sea. Fred. 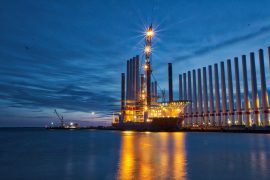 Olsen Windcarrier has devised a solution which allows the jack-up Bold Tern to simultaneously perform bunkering and loading of wind turbine components for the Borkum Riffgrund 2 project at the Port of Esbjerg. 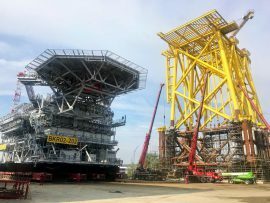 HSM Offshore has started the load-out of the offshore substation topside built for the Borkum Riffgrund 2 offshore wind farm at its yard in Schiedam, the Netherlands. 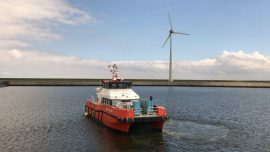 Dutch offshore logistics service provider DHSS has completed the first CTV cargo run from its base in Eemshaven to the service operations vessel VOS Start at the Borkum Riffgrund 2 offshore wind farm in the German North Sea. Fred. 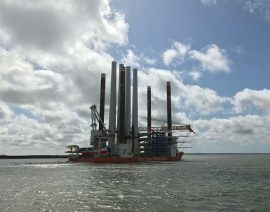 Olsen Windcarrier’s jack-up vessel Bold Tern has returned to the port of Esbjerg in Denmark to pick up the second batch of wind turbines for the Borkum Riffgrund 2 offshore wind farm. 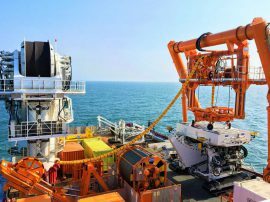 Van Oord’s new tracked remotely operated vehicle (TROV) Dig-It has begun burying the inter-array cables at Ørsted’s Borkum Riffgrund 2 offshore wind farm, marking its first deployment. Fred. 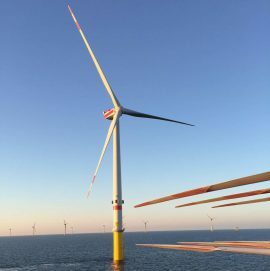 Olsen Windcarrier’s jack-up vessel Bold Tern installed the first MHI Vestas 8MW wind turbine at Ørsted’s Borkum Riffgrund 2 offshore wind farm in the German North Sea on 5 May. Fred. 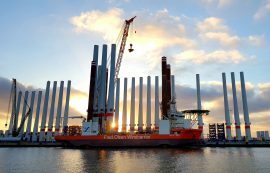 Olsen Windcarrier’s jack-up Bold Tern has left the Port of Esbjerg in Denmark loaded with the first set of MHI Vestas 8MW turbine components for Ørsted’s 450MW Borkum Riffgrund 2 offshore wind farm in the German North Sea. GeoSea’s jack-up Innovation has arrived at Ørsted’s Borkum Riffgrund 2 wind farm in the German North Sea to install the first suction bucket jacket foundations.